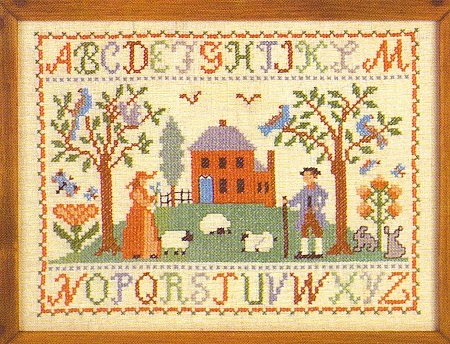 This stamped cross stitch sampler shows an idyllic scene that was characteristic in The Early Colonial Era for some people.With a Manor House on the crest above within their sight,the owners of the land are enjoying the happiness of everyday life as they pause to watch their sheep.This printed cross stitch sampler craft kit is surrounded by an alphabet border. I just can't say enough good things about my sampler kit I bought a couple of weeks ago. I am almost finished, and it is beautiful! The colors online and in the catalog don't do it justice. The actual colors are soft and beautiful, and give it an older look! I am an artist, and my work is very, very detailed. Plus, I have done counted cross stitch in the past. Over time, it has taken a tole on my eyes...no more fine cc stitch! The samplers on this website are the answer to my stitching problem! I can work these better, but they have that antique look and fine look of the counted cross stitch. I will definitely be a customer again! This is going to be a challenge,but when completed it will be a work of art. I am pleased as punch with this new sampler! I've only just started working on it, but I'm adoring it. It will be a bit of a challenge as I'm definitely a beginner (have only done one prior cross stitch before, one of the beginner kits from Country Stitching). But it doesn't seem too difficult at all and is already looking so beautiful. Thank you for providing these kits and introducing me to a new hobby! I just ordered this alphabet sampler and cannot wait to get it in the mail. Every item I have purchased from Country Stitching has been wonderful. The quality of the product is excellent. This will be my 6th item I've ordered! A for-life fan!